The SV241, SV242, and SV261 Series valves are 3-way, direct acting, and normally closed. The SV241 and SV242 can be used for liquids or gases, while the SV261 offers a quick-exhaust feature and is limited to air use. The most common application for these 3-way valves is the control of single-acting cylinders or spring-return actuators. The pressure inlet port is blocked in the de-energized position. A 3-way normally closed valve has 3 ports labeled 1, 2, and 3. When de-energized, no flow occurs from port 1, but there is flow from port 2 to 3. When energized, flow occurs from port 1 to 2, but no flow occurs from port 3. Usually, 3-way valves are used to control larger pneumatically activated valves. Port 1 is connected to the pressure source, port 2 is connected to the cylinder controlling the pneumatic activation, and port 3 is the exhaust port vented to the room. The SV251 is a multipurpose 3-way valve and can be used as normally open or normally closed. During installation, for normally closed select port 1 as supply pressure. Port 2 is connected to the pneumatic cylinder, and port 3 is the exhaust port. To configure as normally open, select port 3 as supply pressure. Port 2 is connected to the pneumatic cylinder, and port 1 is the exhaust port. The SV251 can be used for liquids or gases. 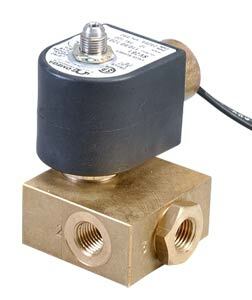 The SV271 is a 4-way, 5-ported solenoid valve, rated for air applications only. It is a 2- position, pilot-operated valve typically used to control doubleacting cylinders or pneumatic actuators. A 4-way valve has ports labeled 1, 2, 3, 4, and 5. When de-energized, pressure is supplied to port 1, which is open to cylinder port 4 and closed to cylinder port 2. Port 4 is closed to exhaust port 3. When energized, pressure port 1 is closed to cylinder port 4 and open to cylinder port 2. Cylinder port 2 is closed to exhaust port 3. Cylinder port 4 is open to exhaust port 5.